“Even we don’t understand what happened,” added the French World Cup winner. 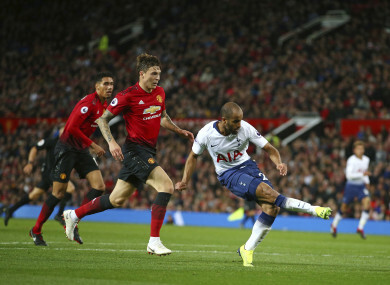 Tottenham Hotspur's Lucas Moura scores his side's third goal. PAUL POGBA SAID Manchester United’s players were in “shock” after a 3-0 defeat to Spurs dealt a heavy blow to their Premier League title ambitions. After a troubled build-up to the season, United have lost two of their first three matches of a campaign for the first time since 1992-93. That season, Alex Ferguson’s men went on to clinch the title but there are few signs that under-fire manager Jose Mourinho can win United’s first league title since 2013 following Monday’s defeat at Old Trafford. “Even we don’t understand what happened,” added the French World Cup winner. “We started the game really well, we conceded two goals in the second half. “The first goal was a real blow, we didn’t understand why, because we had the game in hand. One goal, two… we kept pushing, we had chances, and we conceded the third. United desperately need to return to winning ways at Burnley on Sunday to ease the pressure heading into the international break. Last season’s runners-up are already six points behind a clutch of teams including Spurs and Liverpool but Pogba is keeping calm and focused. Pogba’s teammate Luke Shaw also believes the players can turn things around. “You always see a lot of things in the media that go on about what our dressing room is like,” the 23-year-old told MUTV. Email “Pogba says Man United players in 'shock' after Spurs humbling”. Feedback on “Pogba says Man United players in 'shock' after Spurs humbling”.